Wives, likewise, be submissive to your own husbands, that even if some do not obey the word, they, without a word, may be won by the conduct of their wives, when they observe your chaste conduct accompanied by fear. Do not let your adornment be merely outward — arranging the hair, wearing gold, or putting on fine apparel — rather let it be the hidden person of the heart, with the incorruptible beauty of a gentle and quiet spirit, which is very precious in the sight of God. For in this manner, in former times, the holy women who trusted in God also adorned themselves, being submissive to their own husbands, as Sarah obeyed Abraham, calling him lord, whose daughters you are if you do good and are not afraid with any terror. Since Sarah is generally regarded in her role as Abraham’s wife (and eventually Isaac’s mother), in order to understand her more fully, it is necessary explore the world and the person of the man who enjoyed her honor, respect, and submission. The purpose of this series is to pull back the curtains of history and travel alongside them on their lifelong journey of faith. Genealogy was of prime importance anciently, and it holds significance for us as well to note that their lineage stems from Shem, Noah’s oldest son (Genesis 10:10-26). 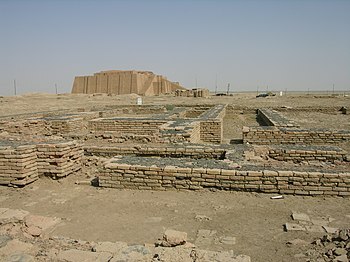 Their father Terah and his clan lived in Ur of the Chaldees, the dominant Mesopotamian city-state during his time, established by the Sumerians and located near the banks of the Euphrates River. If indeed Terah’s sons were semi-nomadic herdsmen, they lived in tents near the great city, using it as their home base. If city dwellers, then they lived in houses. Excavations of ancient Ur have unearthed many such structures, the average being small, of one-story, made of mud brick. Its rooms were grouped around a courtyard. The wealthy lived in two-story, fired-brick homes, plastered and whitewashed inside and out, containing about a dozen rooms. There is one such building alleged by some to be Abraham’s house. It is huge—containing some twenty-seven rooms and five courtyards! 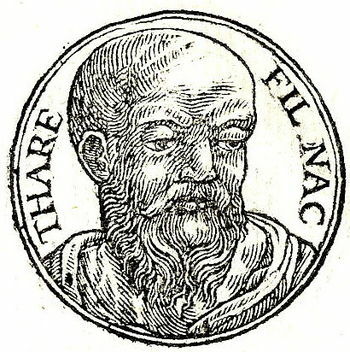 Since environment plays a pivotal part in life, shaping intellect and world view, Terah’s family was influenced by living in Mesopotamia, and Ur specifically. The Sumerians were an accomplished people, credited with impressive innovations and accomplishments over their approximate 1000-year span of influence. They devised a system of writing on clay (cuneiform), which was borrowed and used all over the Near East for some two thousand years. They compiled the first known dictionary, and are recognized as being among the first to formulate and record laws and law codes in order to avoid misunderstandings, misrepresentation, and arbitrariness. Numerous tablets of school texts have been found containing tables (tabulations of reciprocals, multiplications, square roots, etc.) and problems (addressing such practical matters as excavating or enlarging canals, counting bricks, etc. ), evidence of an advanced system of mathematics thought to have begun in ancient Sumer. The oldest collection to date of pharmacopoeia in the form of fifteen prescriptions inscribed on clay tablets is attributed to the Sumerians. Women were the first doctors and dentists in ancient Mesopotamia until, some suppose, these occupations proved lucrative and were taken over by men. Sumerian beer brewing has been confirmed going back to 3500-3100 BC. They loved beer so much they ascribed its creation to the gods. Knowledge of brewing went to the Babylonians who commercialized it and passed laws regulating it. The first brewers and tavern keepers were women. Sumerians invented a brick mold for shaping and baking river clay, thus creating more durable building materials and a system for manufacturing them. Archeologists have uncovered numbers of Sumerian bricks still intact. Recovered Sumerian sculpture (a skill for which they are particularly noted) depicts ancient Sumerians, their appearance and their dress. No doubt writers, poets, actors, artists, fashion designers, jewelers, perfumers, and musicians found a niche among the artistic community of Ur as well. Abram, city dweller or not, could have interacted with merchants, laborers, shepherds, students, teachers, city administrators and workers, professionals, intellectuals and artisans, all busily going about the affairs of the day. His would have been a vibrant world, much like any modern urban center. With this brief exploration into the dynamics shaping a city-state such as Ur, it becomes clear that when Abram received God’s memorable instruction to “get out of your country,” it contained monumental implications. Leaving the comfort and security of the familiar. Leaving family property. Leaving the center of power, commerce, and influence for parts unknown. And ultimately, it meant trusting and yielding to his God’s direction implicitly. The Bible simply records that Abram obeyed, and there is no evidence that Sarai objected or resisted. Thus Abram’s life-long journey of faith began, one which would find his beautiful wife always by his side. Great People of the Bible and How They Lived, Reader’s Digest (1974), pp. 34-35. Kramer says students attended school daily from sunrise to sunset. They devoted years to their study, remaining students from early youth to the day they became young men. Many clay tablets illustrative of school work and compositions have been unearthed at various archaeological sites (pp. 233-236). In the article, “Ancient Egyptian Brewery and Bakery,” beer is described as being “brewed by women in the home as a supplement to meals. The beer was a thick, porridge-like drink consumed through a straw and was made from bippar (barley bread) which was baked twice and allowed to ferment in a vat. 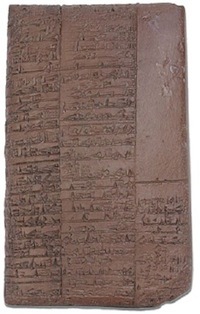 By the year 2050 BCE beer brewing had become commercialized as evidenced by the famous Alulu beer receipt from the city of Ur dated to that time” (http://www.ancient.eu/Beer/). Posted in Abraham, ancient, Barley beer, Beer, cuneiform, Moon goddess Sin/Nanna, Prescriptions ancient, Sarah, Sarai, Sumer, Sumerian beer, Sumerian scribal schools, Sumerian sculpture, Sumerian writing, Sumerians, Terah, Uncategorized, Ziggurat. Bookmark the permalink. And behold, a woman in the city who was a sinner, when she knew that Jesus sat at the table in the Pharisee’s house, brought an alabaster flask of fragrant oil, and stood at His feet behind Him weeping; and she began to wash His feet with her tears, and wiped them with the hair of her head; and she kissed His feet and anointed them with the fragrant oil (Luke 7:37-39). Luke didn’t name the woman who anointed Jesus’ feet, but Simon said she was a sinner. Weeping, she stood behind Jesus, let down her hair and wiped His feet. Her extraordinary behavior disturbed the men. “Among the Jews it was a shameful thing for a woman to let down her hair in public.” In adoration, she kissed His feet and massaged them with oil. Simon thought that if Jesus were truly a prophet, He would have known the woman was a sinner. Responding to Simon’s thoughts, Jesus reminded him that a host customarily greets his guests with a kiss, provides water for washing their feet, honors them with anointing oil—all of which Simon had neglected to do. The woman, however, in heart-felt humility, fulfilled every courtesy Simon had neglected. Jesus called attention to the proportion of her love in comparison to Simon’s: Therefore I say to you, her sins, which are many, are forgiven, for she loved much. But to whom little is forgiven, the same loves little (Luke 7:47). The woman’s hair was very long, long enough to wipe Jesus’ feet. I didn’t find any references to Israelite women cutting their hair for stylish purposes. There are references to women shaving their heads and cutting their hair in connection with vows. If a woman took a Nazarite vow, she couldn’t cut her hair for the duration of the vow. When the woman completed her obligations, she shaved her head and presented the hair in the Temple as part of an offering. A woman cured of leprosy shaved her head (Lev. 14:8). An Israelite soldier that took a foreign woman captive shaved her head, trimmed her nails, gave her new clothing and allowed her a month of mourning before consummating the marriage (Deut. 21:10-13). Women in ancient Israel didn’t wash their hair with the regularity we do today. “How widespread and how frequent non-ceremonial bathing was in Israel is impossible to determine.”  Bathsheba bathed, Naaman bathed, Levites and priests washed before serving in the Temple, and men and women cured of leprosy bathed (Lev. 14:8). In the time of Jesus, some religious leaders made a great show of washing their hands. However, there’s no mention of soap for bathing the body or shampoo for washing the hair. In the ancient middle-east “oil served a hygienic purpose prior to the invention of soap and shampoo.”  Although the Babylonians, Egyptians, Mesopotamians, Greeks and Romans used a compound made from oil, fat and caustic soda to wash clothing, the compound was harsh and tended to burn skin and hair. Women made a body scrub from oil mixed with natron, a mineral deposit that resembled baking soda. The natron scrub had some anti-bacterial properties but gummed up the hair and was difficult to rinse out. It is said that Egyptians washed their hair and their wigs in diluted citrus juice, but I found no references that citrus hair-washing was practiced in Israel. Isaiah, in warning ancient Israel, refers to “well-set hair.” Israel had defied God and would suffer for it. As part of the nation’s punishment, women who prided themselves on beautifully arranged hair, scarves, veils and turbans would experience the baldness of poverty and famine. This image was originally posted to Flickr by Wonderlane at http://flickr.com/photos/71401718@N00/4258937618. It was reviewed on 12 September 2011 by the FlickreviewR robot and was confirmed to be licensed under the terms of the cc-by-2.0. Women paid attention to their hair—covering it, wrapping it into buns, folding, curling and braiding it. They wove ribbons into their braids and fastened them atop their heads with ivory pins. They twined pearls and jewels into their hair. They added gold dust and metallic plates to catch the sunlight. In writing to Christians in Asia Minor, Peter stated that a woman’s outward adorning of arranging the hair, wearing gold, or putting on fine apparel (I Pet. 3:3-4) should never overshadow the inner beauty of a gentle and quiet spirit. The Nelson’s Study Bible states that Peter “is not condemning women who wear jewelry”  or dress in an attractive manner. He encourages a woman to appear and conduct herself worthy of one called to inherit a blessing (1 Pet.3:9). All four gospel accounts mention the occasion of Jesus being anointed with oil by a woman before He was crucified, but with some variations (indicated in italics). The accounts in Matthew 26:6-13 and Mark 14:3-9 agree almost word-for-word. Both writers say that an unnamed woman anointed Jesus’ head with fragrant oil while He was at dinner in the home of Simon the Leper. Some disciples criticized the woman for wasting the oil on Jesus rather than selling it to help the poor. Jesus stated that the woman had done a good work by anointing Him prior to His burial. The act would be remembered as a memorial to her. Luke states that Simon the Pharisee hosted the dinner (Luke 7:36-50). The unnamed woman was a known sinner from the city. She wept at Jesus’ feet and wiped the tears with her hair. She anointed His feet with fragrant oil. Simon criticized her in his thoughts. Jesus drew a lesson about love and forgiveness from the woman’s devotion. He acknowledged that the woman was a sinner, and He forgave her sins. John is the only writer that identifies the woman as Mary of Bethany (John 12:1-8). Lazarus, Martha and Mary hosted the supper. Mary anointed Jesus’ feet with fragrant oil and wiped them with her hair. Judas questioned why the oil was not sold to help the poor. Jesus stated that Mary had the oil in preparation for His burial and that the poor would always be there. Postscript: Who was the woman? Simon may have been related to Mary, Martha and Lazarus, and may have owned the home where the three friends prepared supper. Simon may have been a Pharisee and a recovered leper. The unnamed woman may have anointed Jesus’ head before she anointed His feet. Simon may have condemned her in his thoughts while Judas and the disciples criticized her openly. Jesus may have addressed Simon’s self-righteous lack of love privately and corrected the disciples in public. Posted in ancient, Bible women, Hair, Hair care, Hair ornaments, Hygiene, Jewelry, Luke the physician, Martha, Mary, Soap, Uncategorized and tagged ancient, Ancient shampoo, Beauty, Foot-washing, Hair ornaments, Hair styles. Bookmark the permalink.